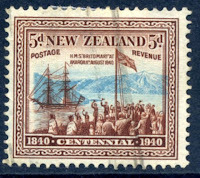 As 1940 approached, New Zealand Government Officials were considering ways in which The Dominion could celebrate its first centenary. A great exhibition was planned in Wellington. I remember my father telling us that as a boy most of his small country school travelled by train from their little community in Northland, all the way to Wellington. They slept in the classrooms of a local school while visiting the Great Centennial Exhibition and taking in the sights of the capital before returning to Northland on another special train. Word spread ahead that this special train was passing through the various town and cities on route and my mother told us that as a young girl she stood at the trackside in Avondale, Auckland, watching it go by. Little did she know that one day she would marry one of those 'country kids' hanging out the windows waving madly. I remember their surprise that day as they realised that they could have looked at each other, all those years before they would eventually meet and get married when my father moved to Auckland. Now back to the point of this blog post. 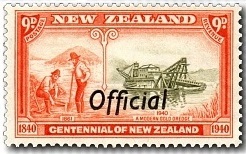 One of the ways the authorities decided to celebrate this centenary was by issuing a special Centennial Pictorial Stamp Issue. 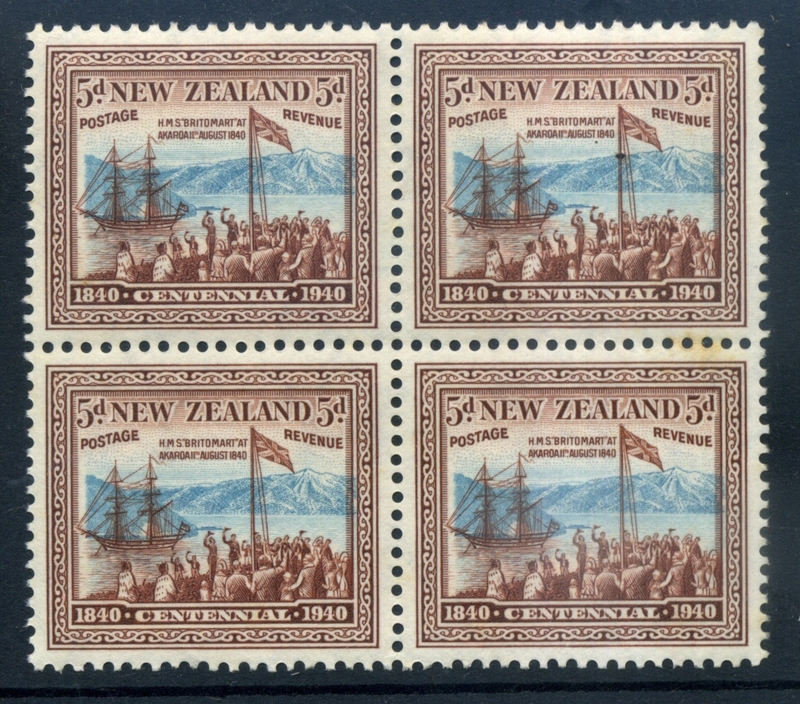 This thirteen value stamp set, known as one of the better ones New Zealand has issued, depicted a wide range of subjects concerning the development of this young nation. At the same time an eleven piece "official" set was also released, to be followed in 1944 with a provisional overprint. All of these stamps are featured in this post. I have also thrown in a few printing errors and extra items of interest. Each of these stamps tell an interesting story. 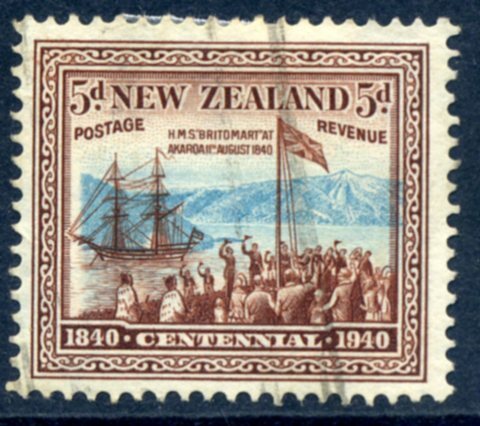 It would be a shame to publish this post without including some of these stories here, so at the bottom I have included each of the thirteen stamps again with more detailed notes on its design and subjects depicted. A number of these designs show Maori people of Maori history. 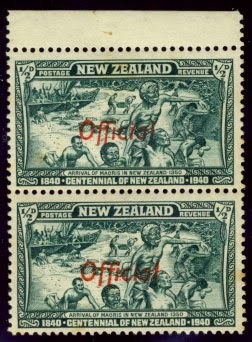 Landing of First Maori - ½d. Captain Cook and the Endeavour - 1d. A Giant Kauri - "Tane Mahuta"
God of the Forest - 1/-. 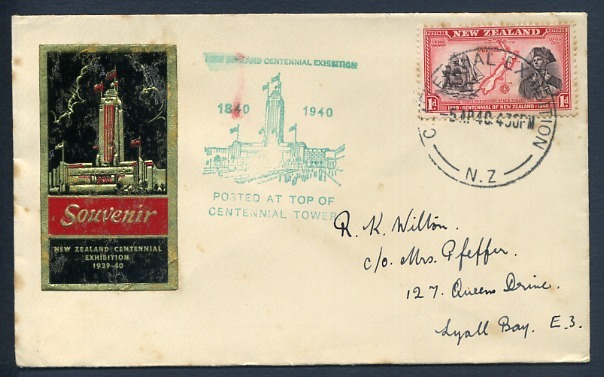 A Second Day Cover of the 1940 Centennial Issue. a Second Day Cover. 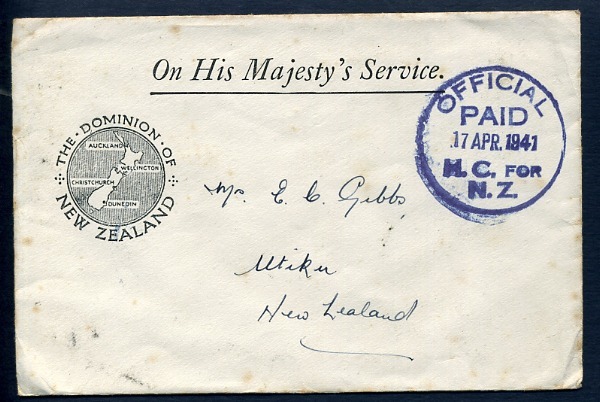 See the date cancel says 3rd January, 1940 It appears this must have been a mistake of some kind and the cover was intended to have been cancelled on the first day of issue. But for me a Second Day Cover is far more interesting. 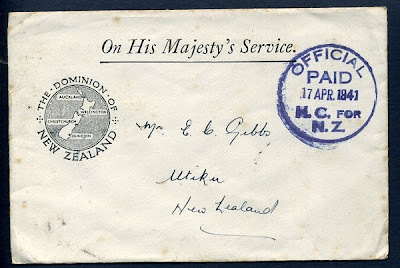 A cover from the 1940 Centennial Exhibition in Wellington, with a cancellation from the Exhibition Post Office, a special office set up for the exhibition. The blue hand stamp states it was posted at the top of the Centennial Tower. 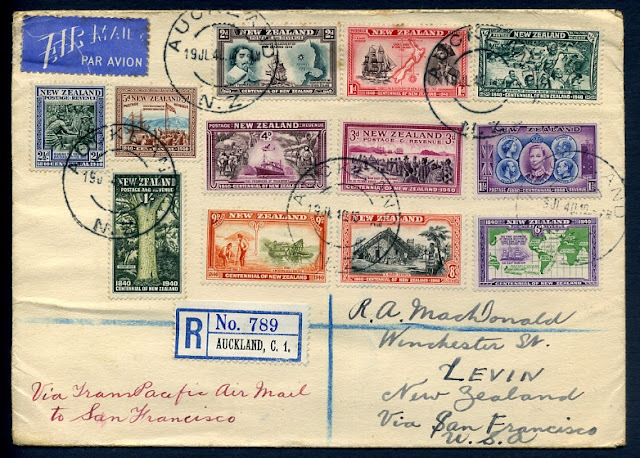 Airmail cover to USA via New Caledonia, Reg. Auckland 19th July, 1940. 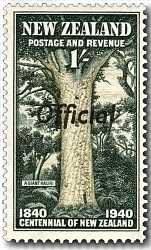 1/- "Tane Mahuta" God of the Forest. This is known as a plate strip since it shows both the plate number and printer. which has off-set onto the back of the stamp above. gap against the frame, while on the right the blue overlaps the frame. 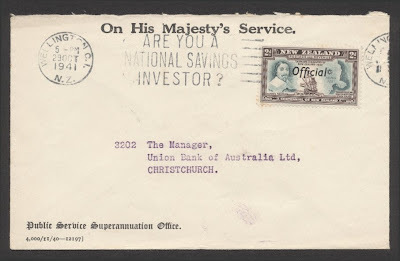 There is another example of this side shift in the stamp below. The black line across this stamp from top to bottom is a post mark, not a printing error. 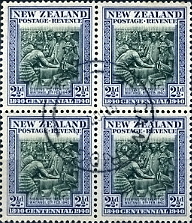 the right block all four stamps show a downward shift of the green. 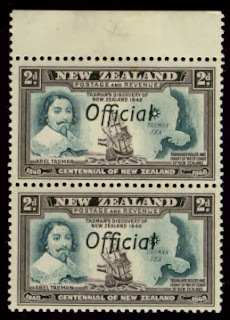 Below are the stamps known as the 'Officials' where 11 of the 1940 Centennials were overprinted with the word "Official" for use by Government Departments. 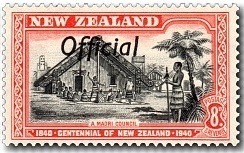 To view all the 'Official stamps produced by New Zealand visit An Official Post. Transport - Land, Sea and Air - 4d. First shipment of frozen mutton - 6d. 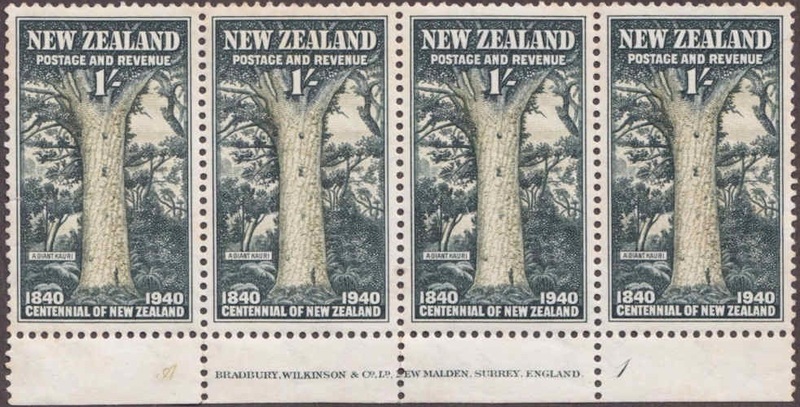 Apart from the 5d, 7d and 10d values, the stamps were overprinted Official. With the ½d, 1d, 2d, 3d, 4d, 6d and 8d values, a variety occurs at row 1/10 in which the ff is joined where normally there should be a gap between. 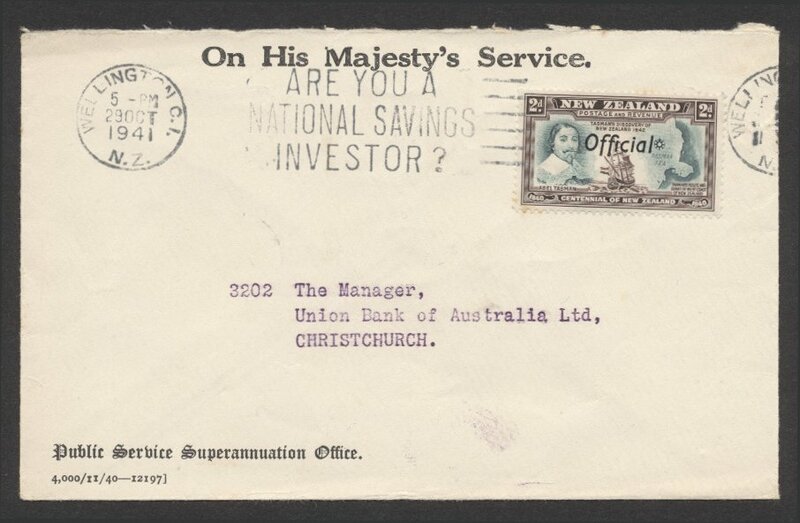 This variety was quickly noticed and became a collector item while still available from the Post Office. Finally, on 12th March, 1941 the Philatelic Bulletin stated: - Stocks of the double "f" variety on the 1d., 2d., 4d., and 6d., denominations of the Centennial Official stamps are exhausted. FF Joined - Variety. FF Gap - Normal. Three examples of the FF Variety paired with a normal. When compared with a normal example the spacing between the "f"s is quite noticeable. Two further examples of the joined FF which seems to have appeared on many of this issue. A cover showing the full set of 1940 Centennial Officials. Two covers with "official" stamps form the 1940 Centennials. Due to a change in postal rates the 1½d Sovereigns was over printed with the word "Tenpence" while the corner values were blacked out. 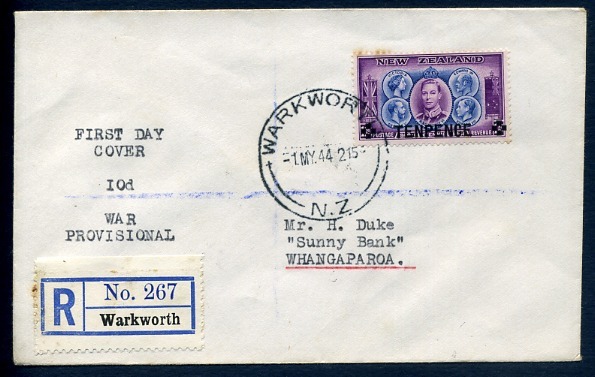 Below is a First Day Cover of the overprint. The Designs in More Detail. 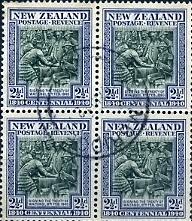 Each stamp in the 1940 Centennial Issue has an interesting story to tell so I decided to include the entire set of thirteen stamps with more details on their design and subjects. For an index to all our posts on New Zealand Maori. At school I was taught that the Maoris arrived in a fleet of canoes and then dispersed to settle in various parts of New Zealand. This has since been proved as a myth with the Maoris arriving over a period beginning around 1000AD. It is also believed that some canoes returned to the Pacific islands, for a while keeping in contact people who stayed behind. For some reason the Maoris stopped building double hulled, ocean going vessels in favour of large single hulled vessels. 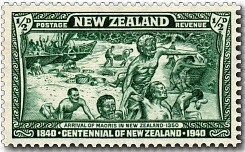 The people living in New Zealand had lost contact with other parts of the Pacific, so by the time the Europeans arrived their old homelands were just oral traditions. The scene depicted on the stamp is an original conception by an artist of the arrival of one of the canoes The Maoris have been pictured here as arriving in a state of physical exhaustion, the inevitable consequence, despite their magnificent seafaring skills, of weeks spent in open canoes. Captain Cook and the Endeavour - 1d. See our collection of Capt. 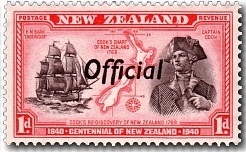 Cook stamps - Captain Cook Stamps of New Zealand. 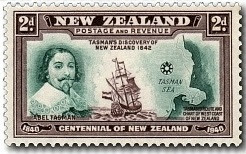 Every child in New Zealand schools is taught that Abel Tasman discovered New Zealand in 1642, but after only briefly exploring parts of the west coast he sailed away again and the country lay unexplored until 1769 when Captain James Cook arrived. 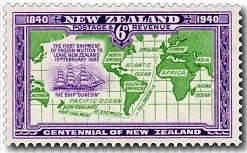 Cook's first voyage was based on the idea that the major land masses of the northern hemisphere must be balanced with a major land mass in the southern hemisphere. He explored around New Zealand in the hope it was connected to this Southern Continent but as we know today this hidden continent never existed. The 1d. 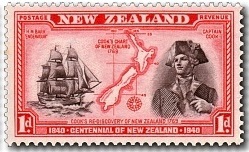 stamp shows Captain James Cook on the right hand side, with his ship the Endeavour on the left. In the middle is one of the first maps he made of New Zealand. This map has proven to be surprisingly accurate in most of its details. Noticeable errors are making Stewart Island part of the mainland and Banks Peninsular an island. 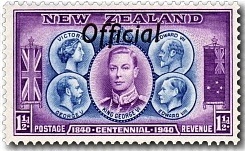 This stamp showing King George VI first appeared in the 1940 Centennials as the 1 1/2d then it was overprinted with the word 'Official' for use by Government Departments. 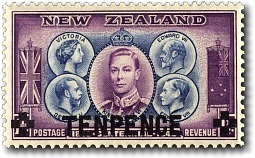 Later it was overprinted with the word 'Tenpence' and re-issued in 1944. The design is very interesting in that it also shows four other royal heads of state as well. In the top left corner is Queen Victoria. In the top right side is her son King Edward VII. 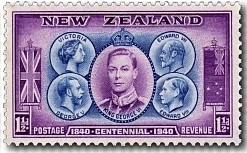 In the lower left is Edward's son King George V. George V had two sons, King Edward VIII in the bottom right corner and of course King George VI in the centre. On the left is the flag of Britain and on the right the flag of New Zealand. Happy Birthday! Penny Black! 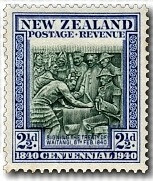 A post marking the history of postage stamps. 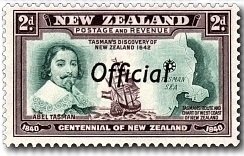 Abel Tasman, a Dutch captain employed by the Dutch East India Company to search for new and profitable lands for trade, first discovered New Zealand on 13 December 1642. The coast line he approached was an open coast where he was unable to land, due to the rough surf, so he turned north looking for a more favourable location. He found what we now know as Golden Bay and landed with some of his crew. A skirmish with the local Maoris cost him some of his men and so he never landed again. Abel Tasman named this new land after the Netherlands province, Zeeland. 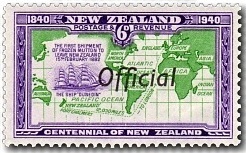 The stamp shows Abel Tasman on the left, his ship the Heemskercq in the centre and the map of the part of New Zealand he explored on the right. The large bay on the map actually turned out to be Cooks Strait between the North and South Islands of New Zealand. On 5 February 1840 a mass meeting was held on the north bank of the Waitangi River mouth, where the aims and purpose of this new Treaty was explained to the Maori. The next day the chiefs signified their willingness to accept the conditions, and 46 paramount chiefs either signed the Treaty or affixed their mark. 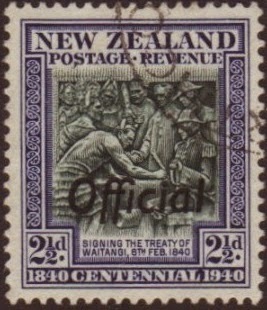 The Treaty was then taken around New Zealand so other chiefs could also sign. 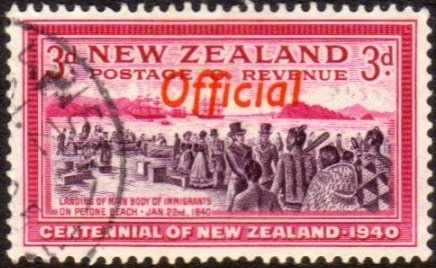 The original signing in Waitangi is depicted on the stamp. 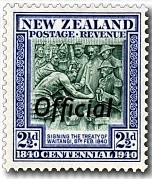 The Treaty of Waitangi was an agreement between the British representing Queen Victoria and the Maoris of New Zealand. It is a basis of harmony between the people of New Zealand today. It may surprise many people to learn that the Treaty is no longer a legally binding document in New Zealand but it is still considered by the Government when settling the land claims made by many different Maori tribes. 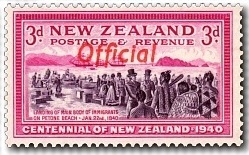 In 1837 the New Zealand Association was formed in London with a purpose to buy land from the Maori and establish settlements of emigrants from England. The picture shows the settlers landing at Petone Beach in what was to become the city of Lower Hutt, across the harbour from our capital city Wellington. This is an interesting stamp in that it features a number of pictures in its design. The theme is the development of transport and its importance to open up New Zealand for future growth. On the left is a bullock team pulling a load over an almost impassable road. Railways proved better at opening up inland areas and a steam hauled passenger train can be seen on the right. In the centre we can see New Zealand's connection to other international countries, first by ship and then later by aircraft. In 1840 concern was growing over the French settlement at Akaroa on the Banks Peninsular of the South Island. It was thought that the French might use this settlement as a basis for an attempt at annexation of the South Island from the rest of New Zealand. 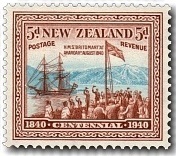 The British warship HMS Britomart was hastily dispatched from the Bay of Islands to perform a flag raising at Akaroa to show the South Island as being under British Sovereignty. 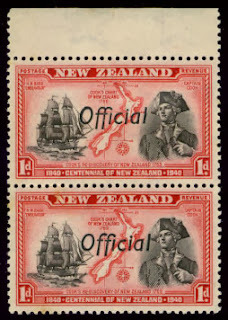 The ship on the stamp above is the Dunedin. She was outfitted with refrigeration equipment so she could transport frozen mutton and beef from New Zealand to England. The first voyage, in 1882, was not entirely successful with a small loss of product being discovered upon unloading but it proved it was possible store and transport frozen meat. This was a major advancement for this young colony as it gave the opportunity to open new markets for pastoral production. Today the export of lamb, beef and dairy products are still very important industries for New Zealand. Maori Council - 7d. Maori Council - 8d. 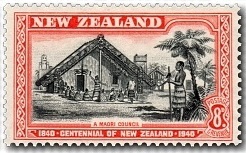 The Maori meeting house is an important part of Maori culture and most important meetings take place either in or in front of the house as shown on these two stamps. The meeting house with the most important building in the village and so featured carvings inside and out telling the history and stories of the tribe. 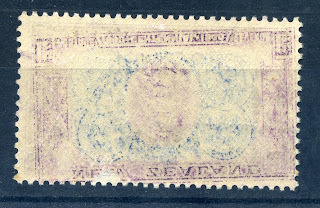 With the out break of war postal rates changed and 7d stamps were found to be no longer required. 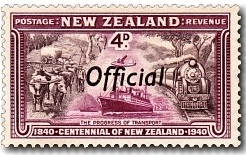 Since 8d was used on parcels it was decided to re-issue the meeting house stamp with this new value. 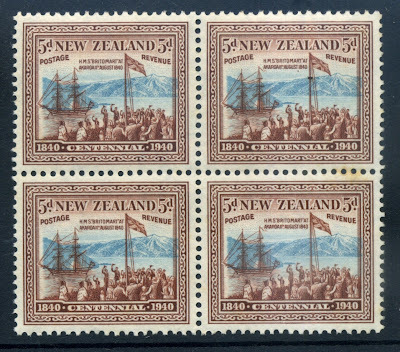 When the Centennial stamps were being prepared, the selected denominations were considered to be the most suitable to prepay the postage rates then in force, but on the 1st October last the rates were increased, and to meet the convenience of the general public, arrangements were made immediately for the printing of an 8d. value. The 8d. 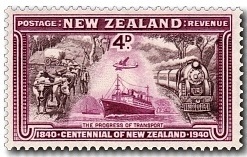 stamp, which is the same design and colours as the 7d. value, will be placed on sale on the 8th March, and the 7d. denomination will be withdrawn from sale at the close of business on the 7th March. Philatelic Bulletin No 1 (1940) 8th February, 1940. Gold was first discovered in New Zealand in 1852 but it wasn't until 1861 that the first major gold rush took place in the Otago alluvial gold fields. Later gold was also discovered in Westland and the Coromandel of the North Island. 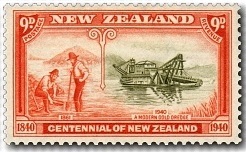 The stamps shows how the gold was originally found by gold panning as depicted on the left while later dredges were used in large scale mining operations. "Tane Mahuta" God of the Forest - 1/-. This giant kauri tree is found in the Waipoua Forest Reserve in Northland. It is one of the largest trees in New Zealand and one of the easiest to view. 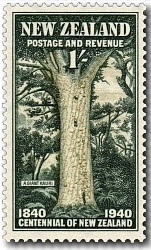 The kauri tree is noted for the way it drops its lower branches as it matures to take on the appearance shown in the stamp above. "Tane Mahuta", which means God of the Forest, is said to be over 2000 years old. Trees such as this have become hollow in their inside and over time will die by rotting from the inside out. Tane Mahuta is now showing signs of this with many dead branches in it crowning head. I remember the first time I saw this tree. We had travelling in darkness to be there at dawn. Walking through the forest as the sun touched the tree tops was an experience caped only by walking around a corner to see this giant before us. The total numbers printed are given below with the numbers subsequently overprinted Official given in brackets. 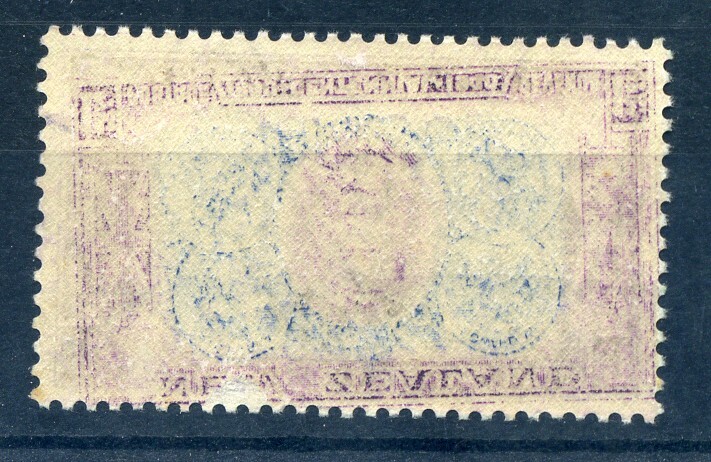 The 5d and 7d were not overprinted. I am not really into stamps but the way you display them make it interesting. A agree with you. Each of these stamps has so much to say.